Many offices celebrate the summer by giving their employes summer Fridays. Which usually means half days. Well Fridays in my office just got a little quieter, our summer Fridays means full day off Fridays. Okay not every Friday, but 7 Fridays. I'll take it! Since the office will be more quiet and Fridays have always been more casual I decided to play around with the graphic tee by dressing it up a bit with a pencil skirt. 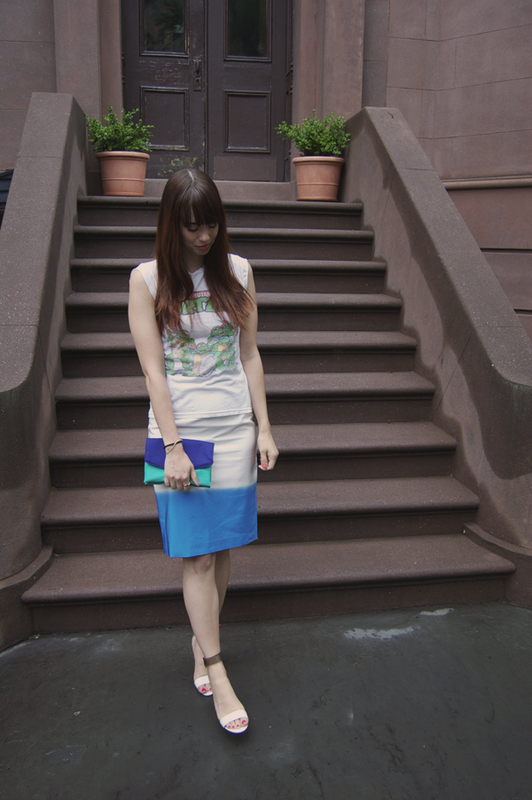 I went bold with my Ninja Turtles graphic tee and paired it with my Tibi skirt (another score from the sampel sale!). To finish the look, I paired it with ankle strap heels to keep it dressy. Dressing up a graphic tee is perfect for those days that call for after work hour cocktails. Also know your office surroundings. Don't go too bold with a graphic tee if you don't think it'll be work appropriate, instead try tees like Ted Baker Briya Bird Graphic Tee or Michael Kors Palm-Print Jersey T-Shirt. Would you dare to wear a graphic tee with a pencil skirt? What a cool skirt, really like the dip dye! the colours are amaze together! The dip-dye on that skirt is gorgeous - good pick! Do you know where that black pencil skirt at the top of the post is from? I know this is kind of old now but its really cute!